Summary: This project is to develop an educational exhibit at the Smithsonian Marine Ecosystem Exhibit at the St. Lucie County Marine Center. The Smithsonian Institution, which operates the St. Lucie County Marine Center, is redeveloping sea grass and coral reef ecosystem exhibits. As part of these exhibits, we intend to include a life-size model of a loggerhead sea turtle and an information display about the other four species of sea turtles common to the Atlantic Coast. Through the exhibits and educational programming, the relationship between sea turtles and sea grass and coral reef environments will be explained. 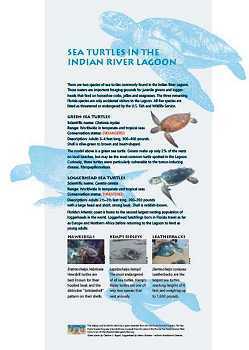 The importance of protecting these ecosystems for sea turtles and other marine species will also be explained.